7,377 Lancaster bombers built for WW2 and only 2 of them left in the world flying. This is the documentary called, "Reunion of Giants" that traces the flight of the last Canadian Lancaster (VRA) still in airworthy condition on its trip back to the UK to meet up and perform with the last airworthy British Lancaster (Thumper) a few years ago. 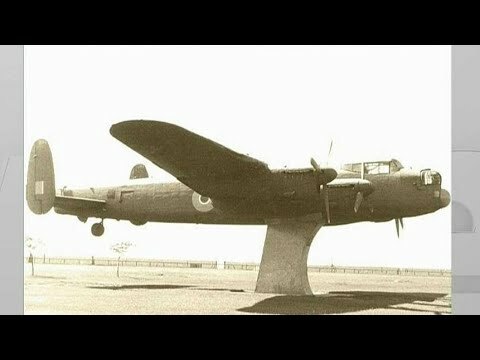 Great documentary about 2 absolutely amazing British aircraft meeting up together with their flight crews and flying together. If you love iconic aircraft and engines, you will find this a fascinating documentary.. God I wish that I had of known about this and I would have been on the ground in the UK. Last edited by ChandlerEast; 01-15-2019, 06:44 PM. And if you want to see the engine swaps of engine swaps, go to 1:09:00. Thanks for sharing Chandler...this is a great video. Rhoda and I went to the Canadian Museum during TRials 2012 and got to stand next to this Lancaster, what a wonderful machine! I was in London in 1990 for the 50th anniversary of the Battle of Britain and there was a low pass flyover in London of many of the remaining flight worthy Spitfires, Hurricanes, and one Lancaster, plus about 150 modern RAF planes. Beautiful sight and sounds. Some static displays on the ground. That’s an excellent video. My father is a volunteer at the Warplanes Heritage Museum and I have been there a few times; it is well worth the trip. That airframe was retired from it’s last job with the Canadian Coast Gaurd as a maritime patrol aircraft and wound up as a gate gaurdian at the Goderich Municipal airport in Goderich Ontario where I grew up. It was brought there by a local dentist who was a member of the local Royal Canadian Legion branch. I wish I could tell you his name but I don’t know. He elected to put the main and tail wheels on 3 pedestals rather than a single point in the bomb bay which apparently requires cutting of the formers and bulkheads in order to fit rails from railroad tracks to support it and thus destroys the structural integrity of the airframe if it is to be restored to airworthiness. Since it sat on it’s landing gear it was able to be fully restored. I remember being at recess in grade 1 and seeing the RCAF Chinook came to town to attempt to sling the Lancaster airframe to Hamilton so a restoration could begin. It was not something we would see every day! However, the first attempt was unsuccessful because the downwash of the helicopter on the wings made it too heavy to lift. The wings were eventually removed and put on a flatbed and the fuselage was then slung beneath the helicopter to Hamilton so she could begin her new life there. IIRC it as 12 years (possibly more) before VRA was ready for trials which given that almost all of the labor was voluntary is quite impressive. At some point in the museums history its hangar and many flying exhibits (which there are many) was destroyed by fire but luckily the Lancaster had been parked outside and escaped damage. One of their most recent acquisitions is a DC-3 from Environment Canada that actually served during the D-Day invasion which has just come back from the paint shop where it has been redone in camouflage livery and apparently it has signatures of many of the paratroopers who jumped from her written somewhere inside. Obviously, these have been retained! Dad has sent me a few pics of the DC-3 but sadly I cannot attach them as I lost a bunch of texts when my last phone kegged. All the more incentive to go see it in person I guess! Glad you guys enjoyed the video. It was awe inspiring to see the clips of the Lancs flying together. And then when they added the Spitfire and the Hurricane. Wow. Really nice to see the part where VeRA was finished her tour of the UK and was flying lead with Thumper trailing and then Thumper just gently turned to the right and headed for home. So appropriate. My father was born in November 1930, so he would have been only 8 years old in September 1939 when the war broke out, however his three older brothers volunteered for service. The oldest brother Winston was a military cop (you had to know him), George the second oldest was actually a gunner in a Lanc so there is that connection to these planes, and Staunton (he went by Staun) was the youngest at 17 was in the infantry in Italy where he was in some of the worst fighting in the war and was shot in two separate battles (as he told it, once by the Italians and once by the Germans.). Sadly, they are all gone now. George left behind some extensive diaries and note books of his time in the RCAF. He stayed in Europe to continue to fly in the Lancs when he could have rotated home. I have some of his notes, but others are at my aunt's house (his sister). I will dig them up and post them one of these days. Last edited by ChandlerEast; 01-20-2019, 06:16 PM. I was aware that they offered flights. I'd love to go up in it and the money would go to a great cause. I was aware of most of what you posted, but I could never find anything on line about it (how someone was smart enough to mount this Lancaster in such a way that it would be able to be restored.) I have seen planes where they mount it on a concrete spike and to do that, they usually end up cutting the main spar and that's all folks. So very fortunate for us all that your family friend was smart enough to figure to display her in a way where she didn't need to be crippled. I was a kid when VERA was transported to the Hamilton airport and I was actually out playing in the front yard and saw it being flown right over my parent's house. From there, as I grew up, I'd go to the airshow every year and watch the progress as they restored her to flying condition. Probably took them 10 years. I have photos of a much younger me at the airshow standing beside the Lancaster. If I recall correctly, the Lancaster that was on display in Toronto was mounted in such an awful way. (I think it was down by the CNE). They pulled it off the spike years ago, but she will never fly again. To make maters worse, they started to restore it (thought it would never be air worthy) up in Downsview at the aviation museum there and some government buffoon decided to tear their hangar down. So the museum and the Lancaster was out in the cold. The Lancaster was boxed up in some warehouse, but restoring it would cost millions and they had pennies, so that was out. It languished in a warehouse somewhere until recently it was decided to give it to a town in BC where they say they will restore it to a static display. Hamilton offered to take it, but that was canned because they were figuring that Hamilton wanted it for parts. Even when Hamilton said they would restore it. Just bizarre. Apparently the Toronto Lanc has indeed found its way across the country to BC and it going to be restored to air worthy condition. I was told that that was not possible. So good on them. I hope they do it. Lucky for that plane that it found a good home. But check out the photos of it. They have their work cut out for them. Restoring the iconic Lancaster is expected to cost more than $10 million and take 10 to 15 years to complete. Great documentary! It just shows what cooperation and respect for history can accomplish. Even between nations. This is also what I like about our Brit car hobby too. Working togther is the key to survival of both marque and quality human values.